Many of our clients are small business owners who use our answering services to enhance the service and satisfaction to their customers. We are proud of our small business owners and entrepreneurs as we have found this is a growing trend in the U.S. economy. More time for core activities: When you outsource customer service (e.g., hire a small business answering service to handle all inbound calls from clients), you can focus more on your core activities without sacrificing the quality of your back office operations. Reduction in overhead costs: As your business grows, so do your expenses. But instead of spending on expensive equipment, invest in outsourcing instead. In this way, you pay only for what you use and for how long you use it. You won't have to worry about maintenance and replacement of hardware. Fast setup of operations: Third party service providers specializing on a process can immediately make their services up and running -- sometimes within days, other times, even within hours. You can't expect the same if you're doing everything yourself and starting from scratch at the same time. Savings on labor: Hiring and training people can eat up a big portion of your budget, so why spend on employees serving a support-only function? It's better to invest on recruiting and educating people who'll work on your business's core activities and leave the support to third-party service providers. Improvement in efficiency: When you have more time for what matters most, your business becomes much more efficient. Third party service providers are really helpful when it comes to taking on peripheral processes so that you wouldn't have to worry about them. Better flexibility: Technology and its accompanying regulations evolve quickly especially in this digital age. Outsourcing gives you the option to adapt to change much faster to any new changes in the tech front. Do you think outsourcing is right for you? Just try it out and see for yourself. Something as simple as a small business answering service is enough to make a difference. Instead of buying telecommunications systems, recruiting phone representatives, and training them for weeks, why not avail the services we offer at A Better Answer Call Center Services? We've been in operation since 1971, so you can count on us to know exactly what we're talking about when it comes to great customer service. Contact us to learn more about what we can do for you. We all lead such busy lives that sometimes saying a simple ‘Thank You’ escapes us. We live in a world of multi-tasking, stress management and overwork. We stay so busy going from one thing to another and handling problems and crises, we sometimes forget to thank those who surround us who quietly give us support, work hard and are always there for us. In our business of telephone answering and call center messaging, sometimes it’s difficult for us to rip ourselves away from all the ringing telephones, personnel challenges and our own personal situations to look up, take a breath, look around and see a light of security we always take for granted. Over many years, ABA’s customers have taken time to recognize all the work we do for them behind the scenes and even in front of the activities. They send us thank you notes, boxes of chocolates, lunches, tickets to events … the list is endless of their kindnesses and recognition of our staff representing all their telephone-related business needs. Thank you dear customers! We recognize the extra effort it takes for you to take time away from your own businesses to say thank you to our ABAers. Our ABA customers recognizing us as a necessary and integral part of their businesses made me look at some of our vendors and want to say ‘thank you’ to them as well … ‘paying it forward’ so to speak. I wanted to especially recognize our most important vendor – our bank. 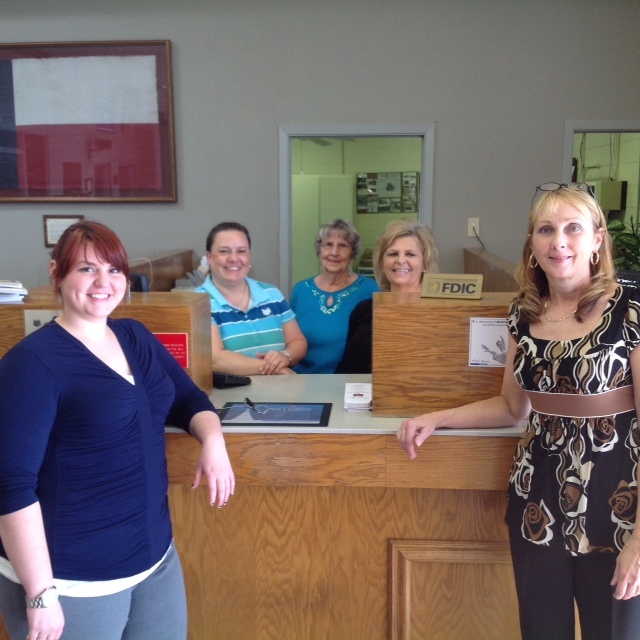 ABA has done business with Citizens State Bank of Princeton, Texas for over 40 years. They are always there, carefully guarding ABA’s money, doing transfers as needed, protecting all our payroll information, handling all the ACH transactions – so many things they do in a day for us – and they are always cheerful, efficient and always there for anything ABA needs. Our staff deals with them daily, so one day we just decided to drive up and visit. We brought lots of exotic cupcakes because we wanted them to know just how special they are to us. We had the opportunity of bringing about a dozen ABAers to meet Citizens State Bank’s staff … from the President, to Bank Officers and our favorite tellers who handle our drive through business daily. Of course, in business, it’s imperative to have a good working relationship with your bank. Although we could have said ‘thank you’ on the phone, seeing everyone face to face brought us closer now knowing the faces behind the voices – much like our own answering service business. 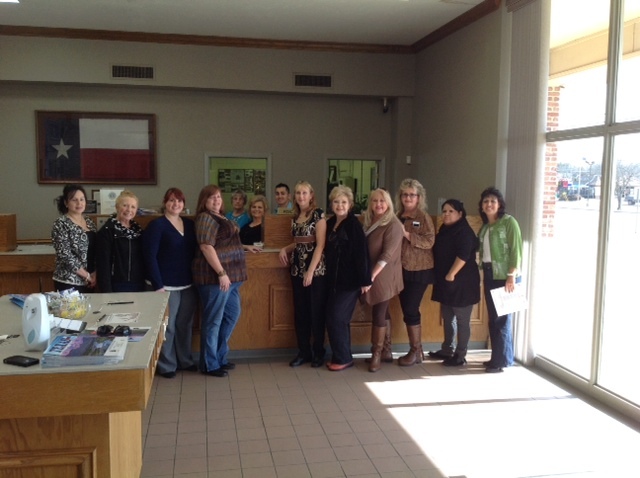 Citizens State Bank and A Better Answer staff. We know our customers like seeing our people who answer their phones, now we know have a greater appreciation of those who help us behind the scenes. What a great trip it was to take everyone and make this experience so memorable. Thank you – thank you – thank you from everyone at A Better Answer Call Centers®.